Pricemoov is a company that provides optimal pricing suggestions and solutions to its customers so they can stay competitive in their industry. Pricemoov’s challenge was that data originating from old SI systems, Oracle or MySQL was inefficient and required a full-time developer to perform long ETL steps in PHP for cleaning. The solution? 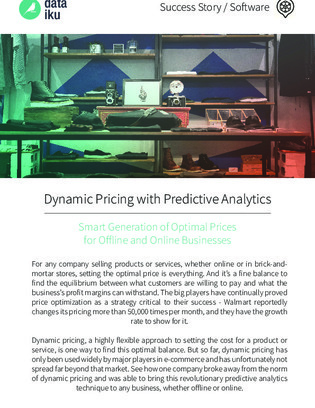 Pricemoov discovered Dataiku’s Data Science Studio (DSS), which has transformed their business with predictive analytics and machine learning capabilities. Read this case study to find out how, and learn if Data Science Studio can do the same for your business.